Clay Motley, director of FGCU’s Honors College, made sure to connect Florida Gulf Coast University with the study abroad program at Harlaxton College in England soon after arriving here from Western Kentucky University. His responses to questions about the program offer unique perspective and insight into a semester at Harlaxton. How did FGCU’s partnership with Harlaxton College begin? At my previous university (Western Kentucky), I was in charge of the partnership between the university and Harlaxton College. We sent about 15 to 20 students every semester to study at Harlaxton, and almost every single one of them had an amazing academic and personal experience. I also was fortunate enough to lead four different summer study abroad programs based at Harlaxton while I was at my previous university. I’ve probably spent collectively about two months of my life living at Harlaxton. Through all of these activities I was able to get to know Harlaxton’s administration, faculty and staff very well. They are a very impressive and committed group of people that provide an extraordinary academic experience for American students in England. When I was hired at FGCU in summer 2015, one of the very first things I did was approach Elaine Hozdik in the International Services office about creating a similar partnership. I wanted to make sure that FGCU students had the opportunity to study at Harlaxton and have life-changing experiences like I had seen other students have. I am happy to see that this is now happening at FGCU. I believe we have had close to 10 students study at Harlaxton or are in line to study at Harlaxton as of next fall. I believe this is going to increasingly be a popular study-abroad destination for FGCU students. Is this program only open to Honors students, or students in particular fields of study? Any FGCU student from any major is eligible to apply to study at Harlaxton. It is not just for Honors College students. In fact, I think that the students who have studied at Harlaxton thus far are about half Honors and half not Honors. Harlaxton tends to offer more lower-division classes than upper-division classes, so the ideal time to study at Harlaxton is during the sophomore year. However, students have studied at Harlaxton even as seniors. All students are required to take the six-hour core British Studies class. There is a strong emphasis on history, literature and art in that class. However, students from majors as diverse as biology, engineering, mathematics, education and nursing have studied at excelled at Harlaxton. What makes the Harlaxton experience unique compared to similar programs? The manor house itself. 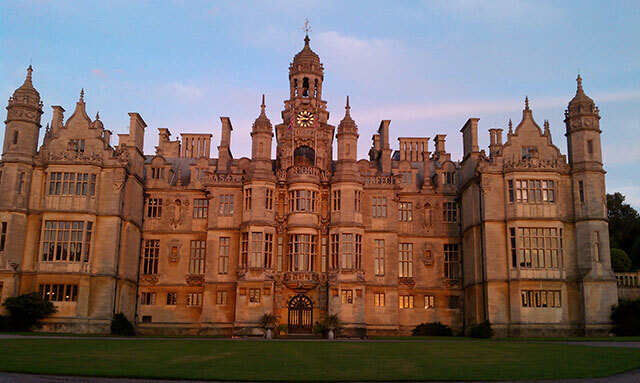 Students live, eat, study and play at Harlaxton Manor, which is a mid-19th century manor house. The house is itself a lesson in English history and culture. 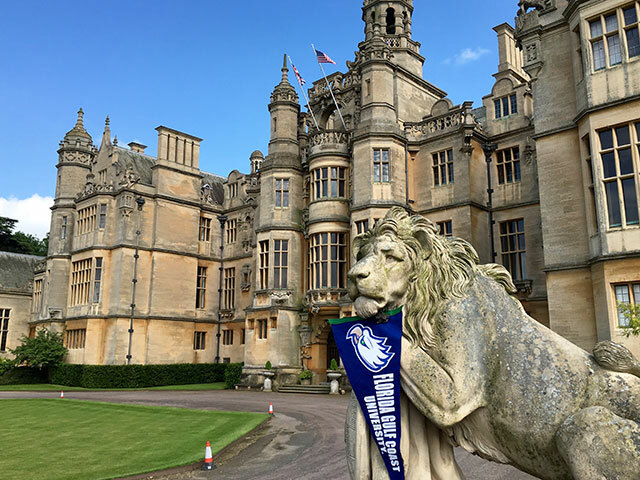 The Harlaxton College academic program is inseparable from Harlaxton Manor. Spending a great deal of time in the manor house while taking classes creates an atmosphere that is impossible to replicate somewhere else. Also, because the students study, eat, live and take classes together in the same place, it creates a very strong sense of community. Students from very different universities remain lifelong friends because of the strong community that Harlaxton fosters. Also, as I’ve already mentioned, the British Studies class is one of the most distinctive features of the Harlaxton experience. Not only do students live in England, but the subject of England itself is a very large part of the curriculum. It is not uncommon for students to say after a semester at Harlaxton that they feel like they understand England better than they do the United States, because they’ve had such an intensive and unique academic experience focusing on England while living in England. The British Studies course is augmented by several field trips to places such as London, York and Lincoln. The students don’t just live in England, but England becomes their classroom. Students also have the option to travel in Europe on weekends. Most weekends at Harlaxton are three-day weekends in order to encourage students to travel in groups. Most students who study at Harlaxton wind up visiting countries such as Spain, Italy, France, Germany and even countries further afield. Certainly, the extracurricular travel in Europe helps develop students culturally. Harlaxton is also a fairly accessible full-semester study abroad program in terms of finances and culture. Not all FGCU students are willing or prepared to do a full semester study abroad in a place like China, Japan or perhaps even a Latin American country. I certainly want to encourage FGCU students to participate in those types of study abroad programs, but I realistically understand that not all students can either afford or are willing to take that large of a cultural leap. A benefit of Harlaxton is that it is an English-speaking country, and that you are studying along with other American students. To some people, that may be a drawback for the Harlaxton program. However, I think a lot of FGCU students who would never take the risk or have the opportunity to study abroad otherwise, will find something attractive and beneficial at Harlaxton. I’ve had students whose first international experience was at Harlaxton, and they continued their international work after that original semester, and then went on to receive a Fulbright Scholarship. What are the benefits of a semester studying abroad? I think any study abroad is beneficial to students. However, a semester-long study abroad, because of its duration, is more intensive and impactful. Students have a much better opportunity to adjust to their new culture, to interact with people who live in the country, and to be further removed from their American background. The world in one’s relationship to the greater world is a very deep and complex thing. Young students can’t come to grips with that nearly as well in just a few weeks. A longer study abroad experience magnifies the positive impact of any international experience. I want students to study abroad for whatever duration their finances and academics allow, but all things being equal, a longer study abroad program is going to be more beneficial study abroad program.